Sorry, “Friday Books” left town for a while. Today I’m plugging What is the Mission of the Church? 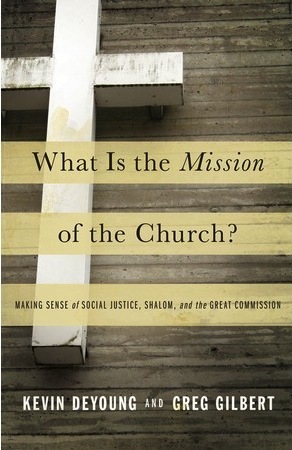 Two pastors (one Presbyterian, one Baptist) wrote a thoughtful book on mission creep, subtitled Making sense of social justice, shalom, and the great commission. Seriously, if you love Christ’s Church you should read this. Its 266 pages will give you a much greater grasp on the answer and why it matters, than I’ll be able to offer in 30-40 minutes this Sunday. 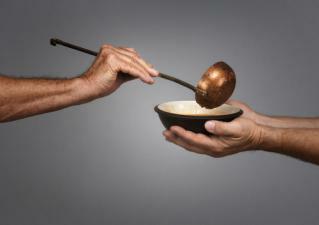 The growing interest many believers have in helping people in need should bring us to our feet in thunderous applause. For example, as a kindness to their communities and a reflection of Christ, an increasing number of churches mobilize their congregations and spend a Saturday or Sunday doing all sorts of kind and helpful deeds. Everything from washing windows or repairing porches, to offering motorists cut-rate fuel at local gas stations. Then there are ongoing need-meeting ministries churches have such as food banks, thrift stores, tutoring, medical clinics, etc. All of which get rave reviews–even by people with zero interest in faith. Increasingly even those who couldn’t care less about the gospel themselves practice “random acts of kindness” and like when we do too. In fact, testy voices from blogs, twitter and in newspaper letters to the editors, declare that such niceness and helpfulness is authentic Christianity–unlike brands which arrogantly pray for the souls of people of other religions as if they are spiritually inadequate. The ingenious phrase “mission creep” was first used about 20 years ago to depict “the gradual broadening of the original objectives of a mission or organization” (Merriam-Webster). In other words, an organization starts out with a mission to build cars, only to 20 years later find itself manufacturing parts for earthmoving equipment or selling leadership seminars. Mission creep. Has it happened to the Church? Have good deeds become the mission, or are these acts of obedience still in their proper place? Acts that today may lobby either to be the mission exclusively–or be an integral part of it, include helping the poor, promoting justice among all people, and protecting the earth. And of course, the Great Commission. Of the many, many good things churches should do, which drives the rest? The authors believe the church has one mission, which they say is …not everything we do in Jesus’s name, nor everything we do in obedience to Christ. Mission is the task we are given to fulfill. It’s what Jesus sends us into the world to do (p.29). DeYoung & Gilbert methodically work their way through many scriptures but it’s the early church portrayed in Acts which they think portrays what today’s Church ought to be doing. And not. If you are looking for a picture of the early church giving itself to creation care, plans for societal renewal, and strategies to serve the community in Jesus’ name, you won’t find them in Acts (p.49). You may not agree with everything, but I doubt that you’ll walk away without rethinking some of the soundbites you’ve heard. Even sermon soundbites.